Oddfellows- all the events in the UK & abroad in 2016!-join now! Images below from the Flowers of May Lodge 617 Bradford Social held on Saturday the 27th October. 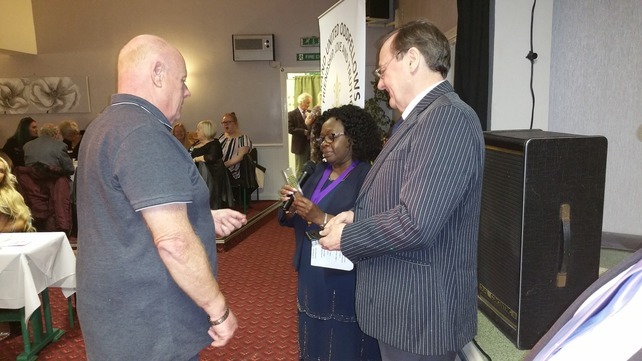 The Grand Master, Sister Marian Blankson-VanDyck, presenting two Devoted Service Jewels to the lodge Trustees Brother David Bailes and Brother David Stamp for their long service to the lodge. Those present enjoyed a great evening of entertainment and a fabulous Buffet and thanks go to the Committee of Management and the lodge secretary Brother John Dyche for putting on a splendid 'do'. 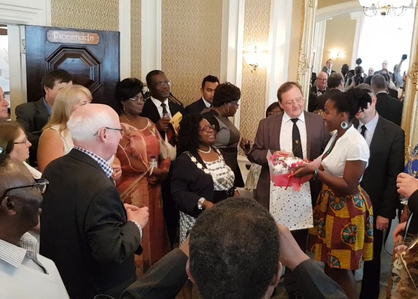 Also the Grand Master Sister Marian receiving a bouquet from the lodge for attending the Social all the way from London to present the awards. Th e Order is pleased to announce that the HUDDERSFIELD RON PRYOR LODGE 94 has now changed the lodge name to the HUDDERSFIELD DENNIS ORTON LODGE 94 ( Past Noble Grand and Lodge Secretary) in loving memory of Dennis Orton who sadly passed away in Ferbruary 2017. The name change has officially been approved by the Prudential Regulatory Authority and the Financial Conduct Authority as at October 2018. All future correspondence should be addressed as the new name. Following on from the initiative introduced by the Huddersfield Lodge 94 whereby Juveniles are encouraged but given the free choice to continue membership after the age of 16 into Adult Membership, the Oldham Lodge 12221 have introduced the T.I.S. ( Transfer Initiative Scheme) with a slight difference. Under this scheme, Juveniles will be given the opportunity and encouraged by the lodge to transfer into Adult Membership with the lodge agreeing to subsidise each Juvenile's contribution up to the age of 21 after which it is hoped they will see the benefits of retaining membership as they grow older. 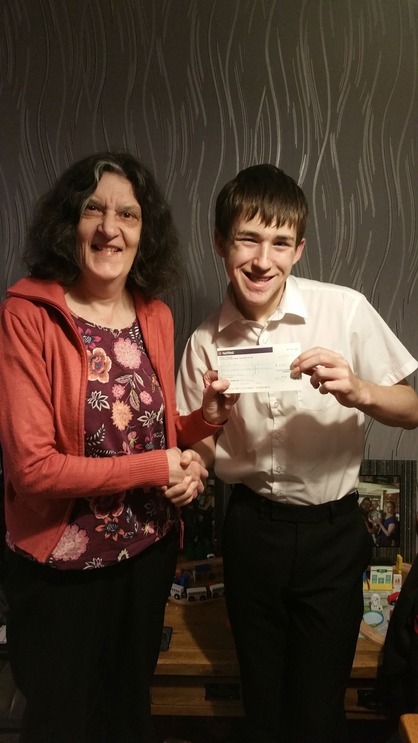 The first member to take advantage of this scheme is Lewis Rogers who is seen accepting his Juvenile IAS pay-out cheque from the Oldham Lodge Secretary Hazel Cahill. Lewis intends putting the proceeds towards some new IT equipment he is saving for and was impressed by all the benefits that future membership can bring. Lewis's mother Sharon is also an adult member. Lodge secretary Hazel Cahill said "it's important to do all that we can to retain young members into Adult Membership if we are to strengthen our total Order Membership and the Oldham Committee of Management agreed that this was an initiative we should try as the annual cost to the lodge will not be that excessive and new members are definitely needed if we are to survive". The Committe of Management of the Bradford Lodge are holding an Inter Lodge Social on the 27th October 2018 at the Field Sports & Social Club Chelsea Road ,Off Hollingwood Lane, Bradford BD7 4AY commencing at 7-00 onwards and ALL Oddfellows locally and nationally are welcome. Board members, delegates , lodge members, friends and family at the toast and gifts presentation after the Installation of the new Grand Master Sister Marian Blankson-VanDyck. CONGRATULATIONS BROTHER CHRIS AND WELCOME TO THIS GREAT ORDERS' BOARD! The Installation of the new Grand Master Sister Marian Blankson-VanDyck from the London United Lodge 11636 at the 2018 Annual Moveable Conference of the Order held at the Imperial Hotel Llandudno on Sunday and Monday the 27th and 28th May. 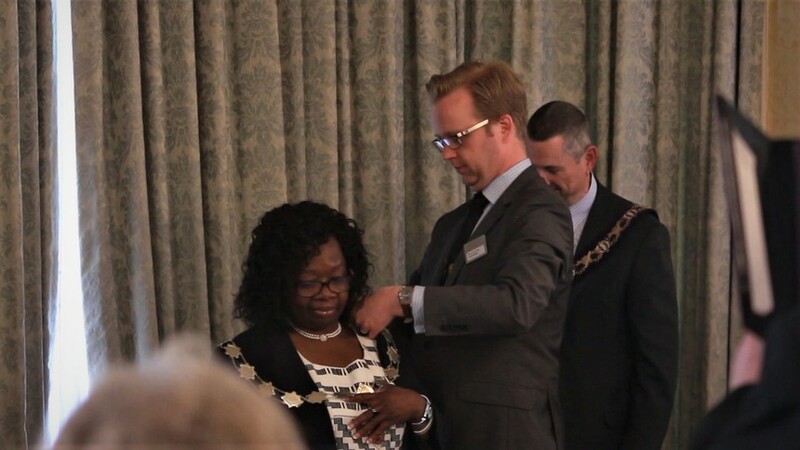 Sister Marian, invested by the outgoing Grand Master Brother Richard Penn, becomes the first ever lady Ghanian Grand Master of the Order in it's long history and will serve for the next two years. Also below, is the investiture of the new Deputy Grand Master Sister Sally Whitehouse from the Ron Pryor Lodge 94 Huddersfield who will also serve as deputy to the Grand Master for the next two years. First pictures from the 2018 AMC held at Llandudno - images from the Church Service held at Holy Trinity on the Sunday morning before commencement of Conference business. The Order has just been informed of the death of Brother Malcolm Phillips of Cawdry Lodge Leek 138. Brother Phillips was a long standing committee member of the lodge holding various positions over many years. His funeral is to be held at 11-30am on Saturday the 5th of May at St Bartholomews Church Broadway Lane Waterfall, Stoke -on-Trent ST10 3JB. Ron Pryor Lodge 94 – News!! 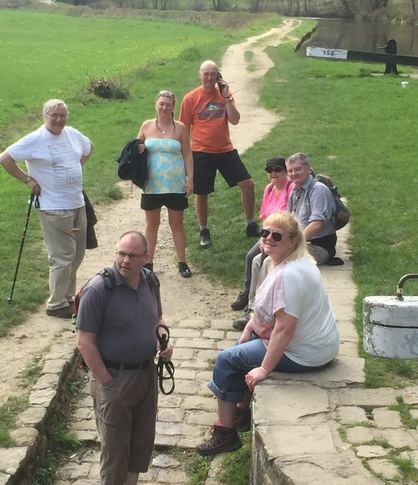 A group of Huddersfield Lodge 94 members set off on Saturday 21st April for a canal walk from Marsden to Milnsbridge. It was a day filled with sunshine, exercise, good company, conversation , and of course a few light refreshments on the way. However, do not let it be said that Oddfellows from Lodge 94 did this solely for their own benefit as £45 was raised for Crohn's and Colitis UK !!. 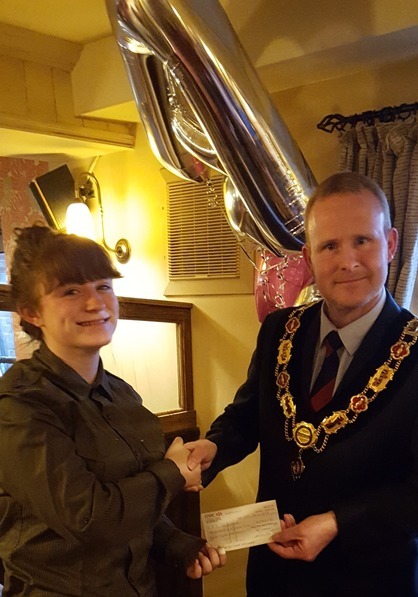 Alice Whitehouse, daughter of Deputy Grand Master Elect, Sister Sally Whitehouse and Brother Graham Whitehouse, celebrated her 16th birthday on 12th April 2018. Brother David Whittaker P.G.M and current Nobile Grand of Ron Pryor Lodge 94 presented Alice with her juvenile membership cheque and collected her completed application form to join the adult lodge. Alice had celebrated her birthday earlier in the day with Sister June Calverley- Hey P.G.M, her God-Mother. Alice is the first juvenile member from Lodge 94 to move into the adult lodge taking advantage of the newly agreed scheme the lodge has set in place to encourage juveniles to join the adult lodge when reaching 16 - No membership fees for 2 years. Concerned about the ratio of juvenile to adult lodge conversions, members of Lodge 94 recently took the decision that the Lodge will pay the first 2 years IAS membership for their juveniles when joining the adult lodge. Taking the view that ‘every little helps’ the initiative is hoped to encourage applications to the adult lodge where all new members will be warmly welcomed. Alice hopes to carry on in the Order to follow in her mum’s footsteps. The Order are holding the 155th Annual Moveable Conference once again at the Imperial Hotel Llandudno under the final year of the Grand Master Brother Richard Penn's Presidency. 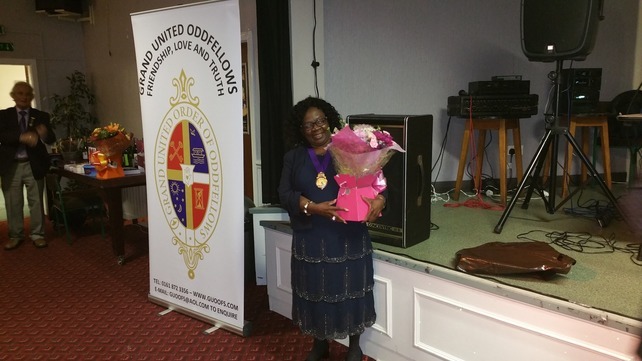 He will be succeeded by the current Deputy Grand Master Sister Marian Blankson-Van Dyck, who will become the very first Lady Ghanian Grand Master in the history of the Grand United Order of Oddfellows Friendly Society. We wish her well over the forthcoming two years of her office. 5TH MAY 2018 FORTHCOMING EVENT - LONDON UNITED LODGE INSTALLATIONS. The Installations of London United Lodge 11636 and the Household of Ruth London are due to take place at the Imperial Hotel Russel Square London at approximately 3-00pm on Saturday 5th May when the new Noble Grand of the Lodge and the Most Worthy Governor of the Household will be installed for the forthcoming year to May 2019. The traditional ceremony will be attended by a full lodge compliment plus the Deputy Grand Master and Grand Master Elect Sister Marian Blankson -VanDyck plus members of the Board and representatives from other lodges throughouit the country to witness this marvelous event!. The Order are holding a Family Fun Day open to all members, members children, grandchildren and all family members and friends of every lodge. This will be held at Cauldon Lowe Village Hall on Sunday 20th August commencing at 10-00am. Cauldon Lowe Village Hall is located on the A52, it is highly accessible and nestled in the beautiful Staffordshire Moorlands.It is positioned centrally between the historic towns of Leek, Ashbourne and Cheadle and is a stones throw from Alton Towers. The Order wish to thank the Committee of Management of Cawdry Lodge No 138 Leek for their involvement in the arrangements for this Fun Day. 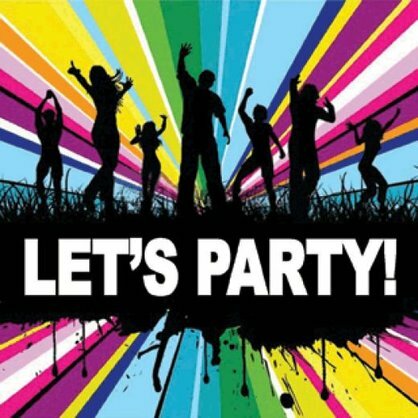 Should the weather be inclement then activities will be held inside the Hall and a wonderful day will be expected. The London United Lodge 11636 held it's Annual Installation Ceremony appointing Worthy Brother Paul Hagan as the new Noble Grand and Worthy Sister Constance Gyamera as the new Most Noble Governor - both for the ensuing twelve months. Huddersfield Ron Pryor Lodge 94 are holding a Social at the PPG Canalside 509 Leeds Road Huddersfield HD2 1YJ at 7-30pm open to all lodge members and other lodges as well!. The Order are sad to announce the death on Monday 20 February 2017 of Brother Dennis Orton from the Ron Pryor Lodge 94Huddersfield aged 65 who has been a Committee Member for many years and has held all positions within the lodge. 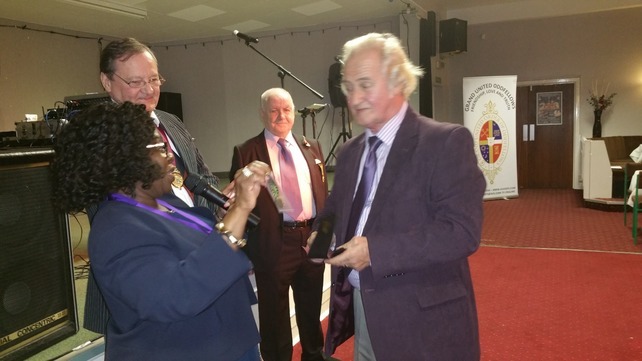 Brother Dennis regularly attended Conferences over the years and he will be sadly missed by family, friends and all Oddfellows throughout the movement. The funeral will be held on Friday 3rd March at Parkwood Crematorium in Elland HX5 9HZ at 3pm followed by the gathering at the Marsh Conservative Club HD! 4PB; an establishment very close to Brother Dennis' heart. Family flowers only - any donations please to the Yorkshire Air Ambulance. The funeral of Past Grand Secretary Brother Harry Robinson will be held at St Johns Church Mosley Common Road Mosley Common Manchester M28 1AN on Friday 6th January 2017 at 11-30 followed by cremation at Howe Bridge Crematorium Lovers Lane Atherton M46 0PZ. The 153rd Annual Moveable Conference takes place at the Blackpool Village Hotel under the stewardship of the Grand Master Brother David Whittaker before handing over to the new Grand Master Brother RichardPenn who will serve for the next two years. The 2016 London Installations took place at the Croydon District & Masonic Hall when Brother A K Mensah was elected as the Noble Grand of the London United Lodge for the coming year. 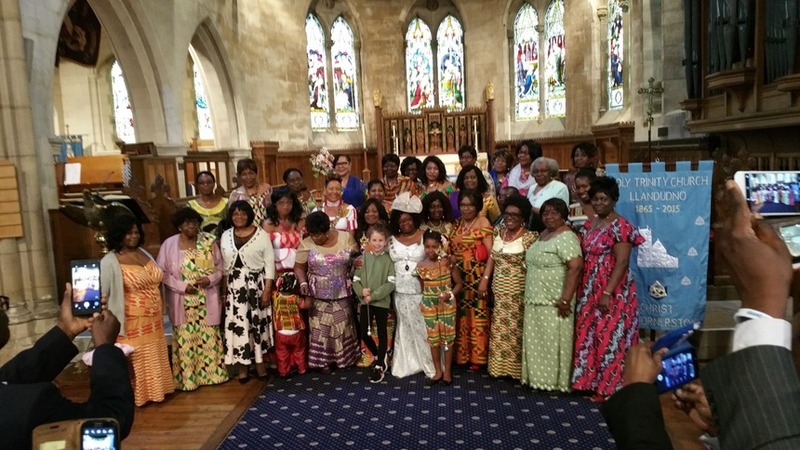 Sister Gloria Otu-Simon was also installed as the Most Noble Governor of the Naomi Household of Ruth London for the coming year. 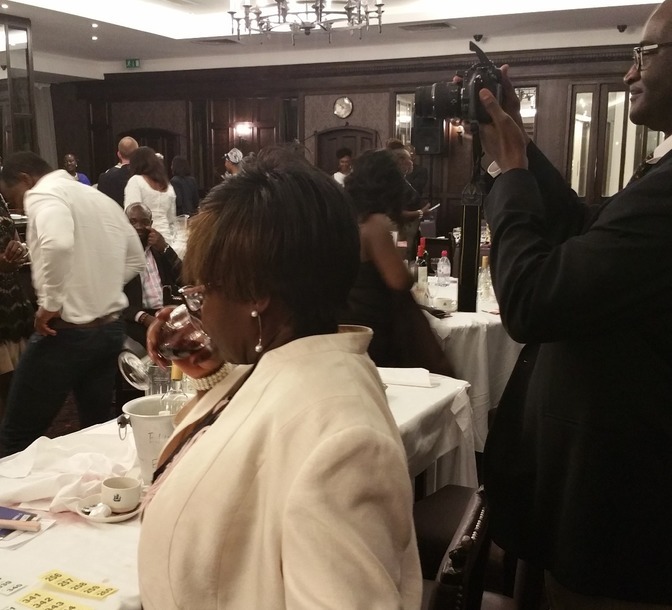 The proceedings were followed by a dinner and dance videos of which can be seen by accessing the 'Contact Us' button above and logging onto the Order Facebook icon. The Ghana Fraternal Annual Moveable Conference held in Takoradi attended by more than 300 members and observers. A pdf file report below and pictures of the proceedings. London United Lodge 11636 held the Annual Installation of Officers as per the Order Rituals on Saturday 2 May 2015 attended by the Grand Master Bro. David Whittaker, Order Director Sister Sally Whitehouse, Deputy Grand Secretary Bro. 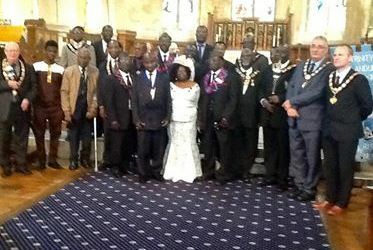 David Oakes and their Consorts, plus Past Grand Master Bro.Emmanuel Ackah and Past Grand Master of Ghana Bro. Fifi Bartels. The Nobel Grand of London United Bro Robert K Abbey., who was installed in 2014, was re-installed for a further one year unitl May 2016 . The ougoing Most Noble Governor of the Naomi Household of Ruth, Sister Irene Johnson, was succeeded by Sister Nada B. Quainoo elected to office for the coming year to May 2016. 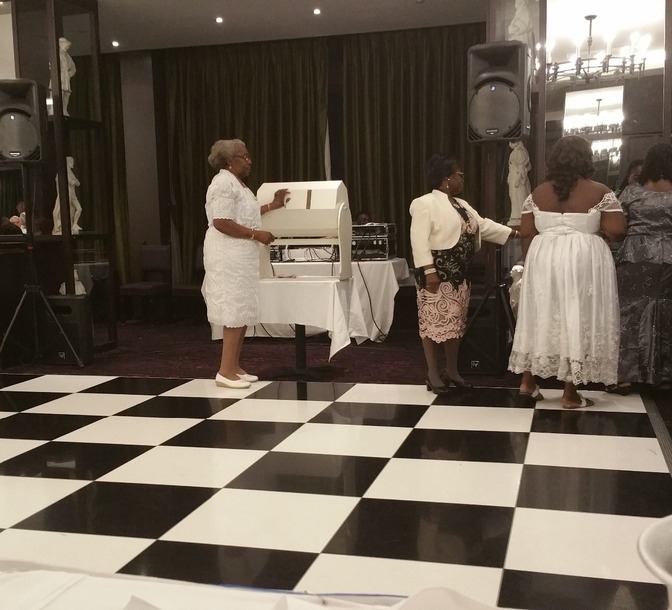 The day's proceedings were followed by a dinner and dance attended by some 150 people who enjoyed good food, beverages and dancing till late in the evening. The Ron Pryor 94 Lodge Huddersfield held a reception for the newly installed Grand Master, Brother David Whittaker, who is a member and Trustee of that lodge and who has been a member of the Board for the past eight years until reaching the highest office in our worldwide Order. The venue for the reception was the wonderful 4*Cedar Court Hotel in Huddersfield and the lodge committee,who organised the event, should take great pride in putting on a splendid function in an excellent setting. 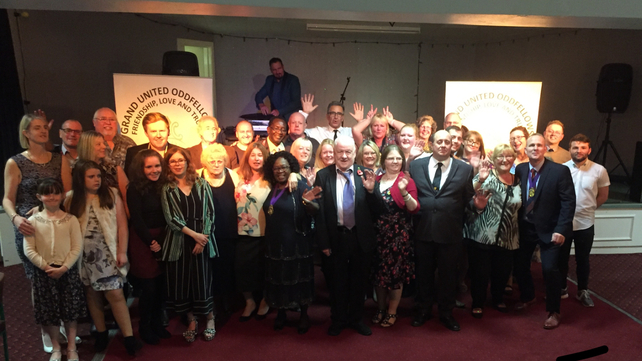 Brother David is seen below in pictures with the Mayor and Mayoress of Kirklees Council,the Board of Directors and a sample of the guests who attended on the evening. 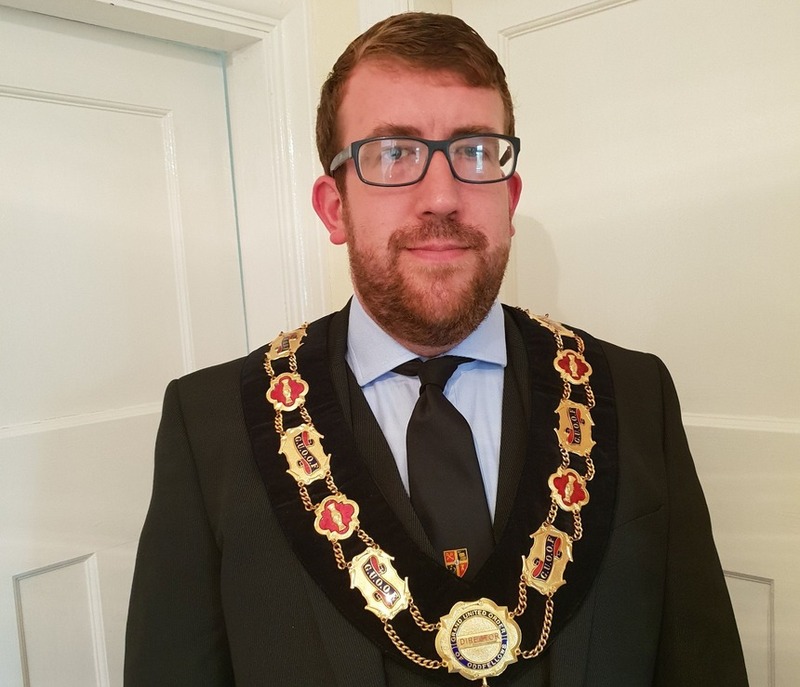 He will serve the Order over the next two years at the Annual Moveable Conference in Daventry in 2015 and in 2016 at Blackpool when he will hand over the Chain of Office. The Grand Master's Reception Brother Richard Penn. London United Lodge 11636 Annual Installation Ceremony.